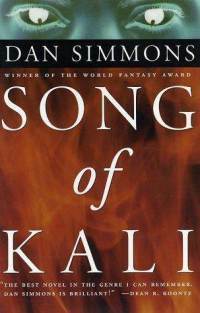 Dan Simmons’ novel Song of Kali was first published in 1985. At the time, Simmons was not the well-known writer he is today – he had a few published short stories under his belt, but that’s about it. Song of Kali was the winner of the World Fantasy Award and received universal priase as a novel as “harrowing and goulish as anyone could wish” (Locus) and “an absolutely harrowing experience” (F. Paul Wilson). “Some places are too evil to be allowed to exist,” narrator Bobby Luczak says. He’s talking about Calcutta. Bobby, a poet and editor (with his partner, Abe) of a literary magazine called Other Voices is being sent to India to retrieve a manuscript by an important Indian writer, M. Das. Das is presumed dead: he’s been missing for years. Bobby takes his wife, Amrita (who was born in New Dehli, but left for England when she was seven) and their infant daughter, Victoria. Rotting residential slums gave way to larger, even more decayed-looking buildings. There were few street lights. Vague flickers of heat lightning were reflected in the deep pools of black water that filled the intersections…the buildings seemed ancient beyond age, decayed remnants of some forgotten millennium – some pre-human age – for the shadows, angles, apertures, and emptiness did not fit the architecture of man. Yet, on every second or third floor there were open-windowed glimpses of humanity inhabiting these druidic shambles: bare bulbs swinging, bobbing heads, peeled walls with plaster rotting off the rib-bones of the building…the sight of sheeted figures lying like corpses in the sidewalk shadows. From the moment Bobby and Amrita arrive in Calcutta life as they’ve known it as intellectuals is tested. Perhaps it is the heat; perhaps it is the lack of those conveniences they’ve always taken for granted, but Bobby’s quest for Das’ lost manuscript takes him to the edge of sanity. Secret meetings, whispered stories and Kali – the Goddess of death- all contribute to the claustrophobic atmosphere Simmons does such a terrific job with. There are some truly heart-pounding moments in this book. But – this is not a horror novel in the traditional sense. Yes, it’s horrific, but ultimately the truly horrible thing that happens to Luczak’s family is not supernatural. And as we all know, men are the most evil beings we’ll ever encounter in our lifetime. So, Song of Kali is atmospheric, creepy and strangely affecting but not in the ways you might expect. This entry was posted in Book Chat and tagged 2011, horror, literary fiction by Christie. Bookmark the permalink.